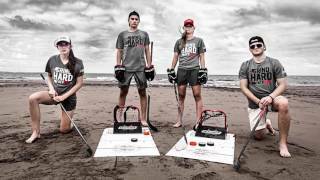 It’s simple, HockeyShot has combined 3 training aids: Puck Catcher Pro, Junior HS Shooting Pad, and Hockey Pucks into one fun game for everyone to enjoy! It’s simple, HockeyShot has combined three training aids: Sauce Catcher, HS Shooting Pad (24" x 48" x 1/8"), and HS Pucks into one fun hockey sauce game for everyone to enjoy! Bring the DIY HOCKEY SAUCE COMBO to your next summer party or family BBQ and become an instant legend! More invites means more teammates! 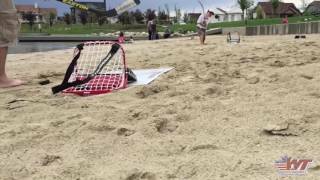 Train your saucer passing this summer with another off-ice innovation from HockeyShot! Sauce Catcher, HS Shooting Pad (24" x 48" x 1/8"), and HS Pucks. Choose the DIY SAUCE COMBO - DOUBLE UNIT and receive 2 Puck Catchers, 2 Shooting Pads and 6 Pucks! Sauce it up. My son loves this. Takes practice and patience to get it down, but once you've perfected it, it's fun to see how many you can get in back to back to back. Fun game to play in the sun! Great product to train with and keeps the whole family in competitive mode. My nephew was so excited about receiving this gift! My grandson loves it a whole lot. My son loves it, uses it all the time! Awesome. My daughter loves it! I bought this for my grandson's birthday. HE loves it !! BRings it everywhere and plays everyday. We've used this quite a bit- easy to transport, we take it everywhere! Well built. It does move a bit when you shoot at it. Considering attaching it to a shooting pad we bought with it. The small sauce pad is not large enough to mount the sauce net. No problems. Prompt and efficient. Cant wait for my son to open his Christmas present! He had been asking for this item for a year!